Parkinson`s disease (PD) is a chronic disorder of the central nervous system, characterized by degeneration of dopaminergic neurons leading to progressive gait dysfunction. To maintain patient’s quality of life, objective classification of gait symptoms in PD is crucial to adequately manage the individual treatment. We will establish a sensor based biometric gait-analysis that enables reproducible, objective, rater-independent assessment of gait symptoms. With a therapist independent rating completely comparable results can be reached. 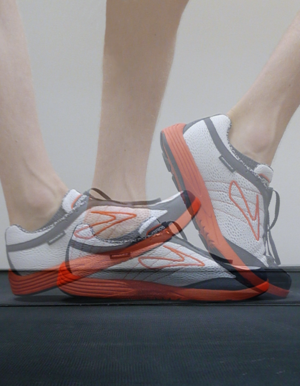 Different sensors (gyroscopes, accelerometers, in-sole pressure sensors,...) attached to a comfortable sport shoe detected motion signals assessed during standardized exercises while the subject is walking or sitting on a chair. Using pattern recognition methods, signal features should be analyzed from PD patients and healthy controls. Classification between patients and controls and a identification of different PD stages should be done. A pilot study suggests that biometric gait-analysis may be an important and complementary mean to support disease management in PD. Future biometric studies will help to monitor the disease course, to modify and adjust treatment thus rationalizing therapeutic decisions. To differentiate between PD specific and age dependent gait disorders also data from subjects in different decades of life should be analyzed. the company ASTRUM IT GmbH. Picture A and B shows a patient while he is doing standardized exercises for recording motion signals. In A he is walks in a comfortable speed and in B he is doing a Heel-Toe-Tapping exercise. The sensor setup is shown in figure C, which is a sport shoe with attached inertial sensors. A typical gait signal of the gyroscope in the sagittal plane is shown in picture D.
The analysis of spatiotemporal parameters of gait is important in different contexts such as classification of diseases or for monitoring of treatment outcomes. Spatiotemporal parameters used in gait analyses do usually not include the durations of all distinct gait sub phases such as loading response, mid stance, terminal stance and pre swing. In this study we focused on the dependency of the gait sub phase durations on speed.